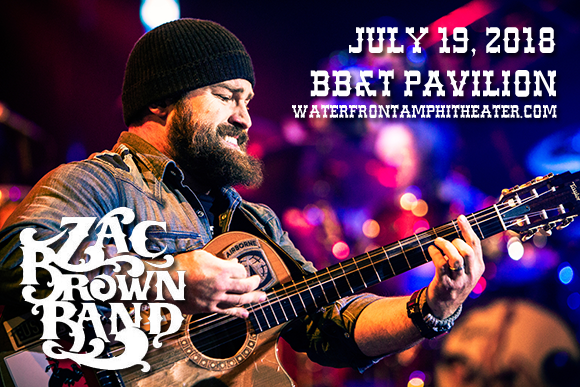 Grammy Award-winning, multi-platinum-selling country sensations Zac Brown Band will be coming to BB&T Pavilion on Thursday 19th July 2018 as part of their Down the Rabbit Hole Live Tour! Nominated for Best Country Duo/Group Performance at the 58th annual Grammy Awards, the Southern rockers seem unstoppable, so join them for an unforgettable night of all-American, foot-stompin' music, live! American country music group Zac Brown Band was formed in Dahlonega, Georgia in 2002 and consists of Zac Brown (lead vocals, guitar), Jimmy De Martini (fiddle, vocals), John Driskell Hopkins (bass guitar, guitar, baritone guitar, banjo, ukulele, upright bass, vocals), Coy Bowles (guitar, keyboards), Chris Fryar (drums), Clay Cook (guitar, keyboards, mandolin, steel guitar, vocals), Matt Mangano (bass guitar), and Daniel de los Reyes (percussion). The band's major-label debut, The Foundation, is certified triple-platinum by the RIAA, with its follow-ups, You Get What You Give and Uncaged receiving platinum certification. The band has released six studio albums, two live albums, one greatest-hits album, and two EPs to date, and they have collaborated with artists as diverse as Alan Jackson, Jimmy Buffett, Kid Rock, Amos Lee, String Cheese Incident, Trombone Shorty, Joey + Rory, Jason Mraz, Dave Grohl, Chris Cornell, and Avicii.